In many cities across the United States, children are gathering at their neighborhood bus stop waiting to board the school bus. Back to school is fun for a lot of kids. They look forward to seeing their friends again and to starting that new school year. Some children are sorry their summer is over, while others have mixed emotions about school starting back again. No matter what their attitude toward school, all children enjoy having treats waiting for them when they get home from their day spent in the classroom. For that matter, we all enjoy a delicious treat at the end of our work day. These owl cupcakes would be the perfect special treat for all of us. 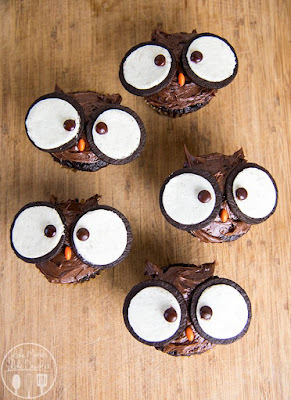 Be wise and prepare these adorable owl cupcakes for an after school treat for your children. They just might stop in the kitchen long enough to share the events of their day with you. That is such an important opportunity for both students and parents, and we all certainly want to encourage our students to talk to us. That is truly the real treat! With a few simple store bought ingredients, these owl cupcakes are quick and easy to decorate. Ellen and Aimee of "Like Mother Like Daughter" share their secret to making these awesome cupcakes. It is simply amazing what Fun Food can be made with Oreos, M&M's and a bit of creative thinking! If you don't have time to bake, why not buy store-made chocolate cupcakes and a can of chocolate frosting to use for attaching the eyes, beak & ears. It doesn't get any easier than that! Psst! ..... These Owl Cupcakes would also make great treats for the classroom parties throughout the school year.